Well you can’t. But you can visit it. And you definitely should! We spend about 7 months of the year in this wondrous part of the world and hand-to-heart, we never tire of its incredible beauty and charm. There’s something about this place that one just feels completely grounded and connected. Connected to both nature’s remote and exquisite beauty and to the vivacious energy of the people from all over the world who pass through day after day, year after year. There’s a spirit here that’s hard to find elsewhere in Ireland, and dare we say the world! We are always finding something new to discover here whether it be an activity, some ancient ruins, a cute café or a breathtaking view and we wanted to share with you some of our favuorite things to do in our favourite Irish town, so that you can maybe try it next time you visit ! For only €15 you can have a bike for the day to go exploring the magical woodlands and parks of Killarney. From the bike shop Lyne’s on the Muckross rd. you can set off on a safe trail into Killarney national Park. You can explore the 19th century mansion that is Muckross house and its grounds at your leisure, cycle on through the forest to by the lakes to Dinis cottage where you can take a break for tea and sandwiches and on to the cascading beauty of Torc waterfall, before following the path back to the town. All in all it can take as little as 2 hours to as long as a full day depending on how you spend your time! You can even bring a picnic and pick a secret little wooded area to have your lunch. It’s one of the best ways to see the Muckross estate but if you’re not feeling up for a bike ride you can also just drive to the grounds and walk around from there !! But don’t be a lazy bones…. Take the bike ride! 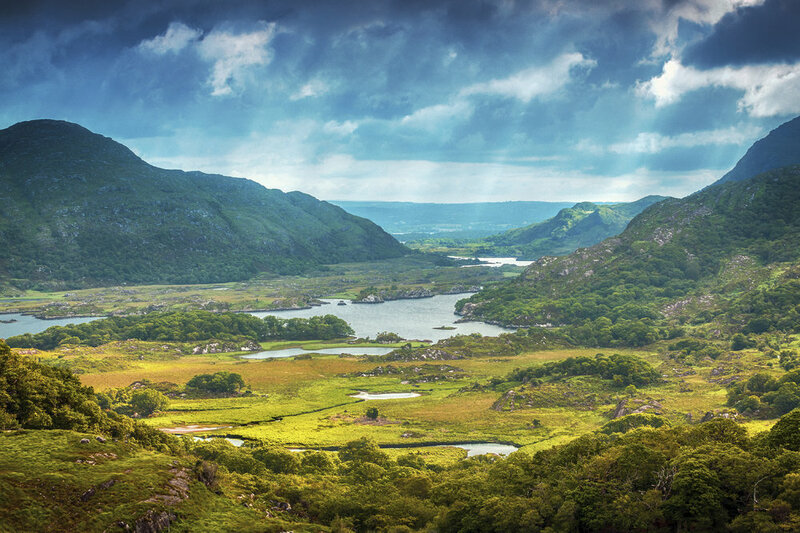 Killarney is famous for its incredible views perhaps more than anything else and this is one of the ultimate ones. As you drive out of Killarney and up the old Kenmare road about 11km out you come upon one of the best views Ireland has to offer. Looking back down on Killarney’s three lakes and framed by fierce craggy mountains it’s like nature designed it for the perfect instagram shot haha! You’ll pretty much see people posing out on the rock any time you visit, rain or shine. It was the backsdrop to our latest music video as well. We told you its one of our favourite places ;) You can see it here in drone captured glory!! The Strawberry Field Cottage is a pancake house, (yes pancakes!!) that is open seasonally (so check before going out here if it’s the winter months as it may not be open). They serve sweet ones (of course) but also amazing savoury pancakes topped with things like Goats cheese, walnuts, honey and thyme (our favourite!) It has a really tranquil garden where you can feast outdoors or if the weather isn’t so kind, the inside has that old traditional Irish vibe which is just as appealing. The coffee is also delicious here, oh and they cater for gluten-free and vegan peeps as well!! Win!! Above is a little video we took of one our trips there last year. Okay so after you have eaten all those pancakes you may want to work it all off with a bit of a walk, and while there are a plethora of walks to do around Killarney National Park, our favourite is admittedly one of the toughest… but we love a challenge and the name kind of says it all. Its definitely strenuous so if you feel you’re not sufficiently fit you might opt for an easier walk at nearby Torc waterfall but if you’re feeling brave, go ahead and climb the steep steps of Cardiac Hill! There’s a splendiferous view at the top that makes it worth it (and also lets you catch your breath) and take no notice if you meet people running up the steps past you at top speed.. they are just showing off! There are a few walking loops you can do which can include or exclude cardiac hill depending on your desired level of exertion but we highly recommend it if you like hiking and want to work up a sweat to go for this one! The title pretty much sums it up. The Europe hotel is a five star hotel sitting on the lakes of Killarney and because there is no end to this town’s enchanting views here is undoubtedly one of the most incredible ones you’ll ever have gazed upon while sipping on a delicious evening cappuccino (or an espresso Martini if you are so inclined). It is one of our number one things to do in Killarney because the luxury of the hotel combined with the splendor of the landscape and if share that time with friends, well, its just what life is all about isn’t it? Now you could eat at the Europe if you desire, or any one of the other top class restaurants in Killarney but if you’re not dead set on having Irish food we dare you to try Khao’s Thai dishes and not love them. Only €12 for hefty portions of some of the best Asian food you could ever eat is a super deal and with everything being so fresh and tasty it’s the perfect end to a day exploring the Killarney countryside. We highly recommend the Pad Thai and friend we have brought there loved the Red Duck Curry! they also do lunch deals which we believe are €10 and include a scoop of delicious gelato! Winning! So there you have it some suggestions for your next or first trip to Killarney to get the most out of it! There’s so much more we could include and we promise we will in another future post!! Have you been to Killarney? What was your favourite experience/ views/ restaurants? 5 lesser known Irish songs you need to hear! ...but sometimes ya just wanna hear something new! ARE WE Right?! Well the beauty is, is that there are so many incredible songwriters on this drizzly green island that there is never a shortage of fresh exciting new Irish music to listen to. We have picked 5 of our favourite Irish songs that we think you may have not heard before (but really need to) and we encourage you to share any others that you know of in the comments below. We can’t continue to let Bono or "Van the Man" get all the songwriting glory for this country now can we?…. While Declan is a seasoned songwriter and well-known among us Irish, we’re not sure how many of you actually know this song, as honestly we had never heard it until it was requested for a wedding we sang at recently. Everything about this song is perfection so it’s no surprise Josh Groban covered it on his Illuminations album. Declan is a musical gem and one of the loveliest guys you could meet. Up next is, in our opinion, one of the best voices and songwriters in Ireland right now, the enchanting Kathleen Turner. While her sister Juliette has known success on our Isle, many have still yet to fall in love with Kathleen. And fall in love you will… don’t say we didn’t warn you! And while the melody and lyrics of Kenmare Bay are hauntingly beautiful, it’s really her voice, full of colour and emotion that paints the scene of this song so perfectly. James Vincent McMorrow is certainly not a new name to many of us but undoubtedly there are still so many people who have yet to be serenaded by this man’s incredible voice. This achingly beautiful song is all about transformation and change and the initial layering of harmony leading to a lightly bluegrass infused folk rock vibe, is just candy for the ears! This is sure to be one of the more well-known Irish songs on the list but we’re always so surprised when we sing it at shows or gig and so many people ask us about it, as they’ve never heard it. Granted, it’s mostly tourists who have not heard it, but we believe its worthy of being as renowned as any of the classic Irish ballads. Written by Mick MacConnell in the 60’s about the troubles in Northern Ireland, its quite possibly one of our Irish songs to sing. One can’t help but feel the passion living in his words and performed here by Christy Moore it just never fails to pull on the heart strings. Limerick native Emma Langford is possibly one of the least known songwriters on this list but hopefully that will change very soon as Emma's songwriting skills and beautiful vocals are just a pleasure to listen to. This song is a particular favourite and the fact that it's in the Irish language makes us love it even more. There is a professional recording of it on Sound Cloud but Emma does a beautiful job of it here too, live. Just gorgeous. So that's all folks, hope you enjoy listening to these songs from this super-di-duper talented Irish bunch! And as we mentioned above, if you have any suggestions we would love to hear them! !